Bollywood actor Salman Khan has hit gold for something other than his super-hit films. Being Human an apparel brand, born out of his CSR initiative, has in its first full year of launch touched revenues of Rs 179 crores in calendar year 2013, after having been launched in 2012. This is no mean achievement considering that many established global as well as domestic clothing brands available in the Indian market have taken several years to touch this figure. Mumbai based Mandhana Industries Ltd owns the worldwide license to design, manufacture, retail and distribute the Being Human brand. The royalties received from the brand go to the Being Human Salman Khan Foundation. Currently Being Human is retailed at 280 PoS’s which includes 23 EBOs and 100 MBOs in India, 152 MBOs in Middle East and Europe and five online stores globally. Revealing the reasons for achieving landmark sales in such a short period, Manish Mandhana – Joint MD of Mandhana Industries tells fibre2fashion, “We followed a multiple retail market strategy and signed up partnerships in various countries with retailers like Shoppers Stop and Lifestyle in India, Landmark Group in Middle-East and similar ones in France, Belgium, etc. He further adds, “Actor Salman Khan too has a role to play in the success of the brand, however as per my observation, they have kept his involvement minimal. Secondly, the brand connects to a charitable cause, which might have also proved helpful. However, both these factors cannot be solely responsible for Being Human scaling such heights, as strategy, product, quality and design too would have played a major role in the success”. “Today, other than India, the brand is available in 16 other countries like, Saudi Arabia, Kuwait, UAE, Bahrain, Qatar, Oman, Jordan, France, Belgium, Spain, Italy, Germany, Luxemburg, Netherlands, Pakistan and was recently launched in Nepal”, Mandhana informs with pride. 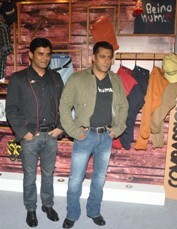 “Being Human now has the complete range of menswear and womenswear garment products beginning from innerwear, socks, caps, slippers, denim, tees, shirts, skirts and anything and everything that anyone can imagine”, he says when asked about the range offered under the apparel brand. He has chalked out big plans for the brand in 2014. He plans to double operations in the current calendar year. “We plan to add 30-35 stores and nearly 100 shop-in-shops. We also plan to debut the brand in South Africa and Canada this year and also launch an ecommerce platform in the middle of this year”, Mandhana reveals.